July 2018 - Page 81 of 82 - HexByte Inc.
A new Lite app of Spotify is being tested on the Google Play Store, with limited compatibility across devices and regions. The app is Spotify’s attempt at offering a lighter app that is designed to work on low-end smartphones and slow internet connection, following in the footsteps of Google and Facebook that have offered similar ‘Lite’ apps for their key services. However, Spotify is still not available officially in India. The premium music streaming service has rolled out its Lite App, but uptake is slow, suggesting that the app has limited availability for now. The primary purpose of the Lite app is to have a similar Spotify experience on an app that is significantly smaller in size, and also claims to reduce data usage. A similar approach is used by Google and Facebook with their ‘Go’ and ‘Lite’ apps respectively, allowing the apps to be used with even slow internet connections and on data plans that don’t have a lot of available bandwidth. The Lite app has received some ratings and reviews on the Google Play Store, which suggest that the app is perhaps too light and lacking in many features. Among these is the inability to select sound quality or download tracks for offline listening, according to a review by a user. It’s important to point out that Spotify itself states that the app is in testing, so it isn’t the final product that will be rolled out whenever the app goes live. Spotify is not available in India officially, with other services such as Apple Music, Amazon Prime Music and Saavn being the leading streaming services in the country. The concept of the Lite app works particularly well in India, as has been demonstrated by various other apps and services in the country. With the Ioniq Plug-In Hybrid’s range of more than 29 miles on a full charge, Hyundai said owners who have short daily commutes might not need to buy gasoline very often. The gasoline engine kicks in when the battery gets low, or the driver switches to Sport driving mode. Outside, the Ioniq Hybrid has two glass panels in the rear liftgate — the larger one on top, and a smaller one underneath. The Ioniq seats up to five people. Leather seats are included on the Limited, along with a color touch-screen audio system with backup camera. 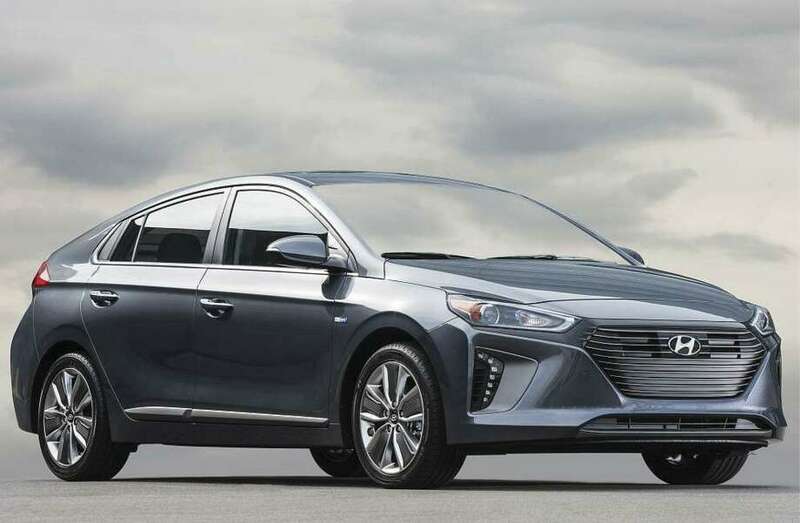 The compact Ioniq Hybrid, introduced last year by Hyundai, entered its second year for 2018 with a starting price of $22,200 (plus $885 freight) for the base Blue model, and it ranges as high as $27,550 for the top-of-the-line Limited. In between is the SEL model for $24,000. And all new for 2018 is the Ioniq Plug-In Hybrid, which can go up to nearly 30 miles on battery power alone before recharging, but also can continue in gasoline mode as well. Also available is the Ioniq Electric, which starts at $29,500, and is powered by battery only. The Ioniq Electric has a range between charges of about 124 miles, but the lithium-ion battery can be recharged to at least 80 percent of full charge in about 23 minutes, using a Level 3 fast charger. With these variants, Hyundai became the first automaker to introduce the same vehicle in three electric configurations: a conventional hybrid; a plug-in hybrid that gives owners both a regular hybrid setup and an EV drive mode; and a pure EV version. The electric model is available at dealerships in California, or only by special order at dealers outside California. The first version to arrive was the Ioniq Hybrid, which has a maximum EPA fuel-economy rating of 58 mpg. That’s for the base Blue model; our tester, the Hybrid Limited, has a rating of 55 mpg city/54 highway/55 combined. For this report, we tested the Ioniq Hybrid Limited, which, like the SEL model, has the slightly lower EPA ratings than the Blue model. The Blue version is rated 59 mpg city/57 highway/58 combined. The Ionic Hybrid and Plug-In Hybrid comes with a six-speed double-clutch automatic transmission. PACKAGE: Compact, five-door, five-passenger, four-cylinder gasoline/electric motor, front-wheel-drive hybrid sedan. BASE PRICE RANGE: $22,200-$27,550, plus $885 freight. PRICE AS TESTED: $31,560, including freight and options (Hybrid Limited, Ultimate Package). Having a conventional transmission gives the Ioniq a more-conventional and sportier driving experience, particularly when the gearshift lever is pushed to the left to engage the Sport mode. That raises the shift points, keeps the gasoline engine on full-time, and allows for spirited driving. When quick pickup for passing is necessary, the Sport mode is the best choice. Hyundai designed the Ioniq to be much more of a driver’s car than other hybrids. The goal is to give consumers a car that does more than just conserve fuel — it also can be fun to drive. The hope is that a better driving experience might attract buyers to the Ioniq who otherwise probably would not consider a hybrid. Hyundai says the Ioniq was designed to compete against regular compact sedans. Prices are in more line with those conventional compacts, though, so there’s no big cost premium for the hybrid drive system. Hyundai says the Ioniq name is a combination of “ion” and “unique,” with the “ion” part signifying that it’s electrified. Our tester had a fairly smooth ride even on some slightly rough (potholed) roads, and the cabin was generally quiet. Overall roadhandling was crisp and sure, and in Sport mode we had good acceleration. To help keep the weight down, the Ioniq was designed with an aluminum hood and liftgate, and it also has no conventional 12-volt battery to power the starter and other accessories. Instead, four cells of the large lithium-ion battery pack are used to create a 12-volt power source, eliminating the weight of the traditional 12-volt battery. Under the hood of the Ioniq Hybrid is a 1.6-liter Atkinson-cycle four-cylinder gasoline engine, paired with a 32-kilowatt electric motor. The gasoline engine is individually rated at 104 horsepower and 109 foot-pounds of torque. The electric motor has 43 horsepower and 125 foot-pounds of torque. Total system power is 139 horsepower. All levels have front-wheel drive. Because the lithium-ion battery is under the rear seat, the Ioniq has a roomy cargo area, with 26.6 cubic feet of space. There is no spare tire, however, just a “tire mending kit,” which as most of us know doesn’t always work, especially when the tire blows out or has damage. Standard on the base model are 15-inch Eco-Spoke wheels and P195/65R15 tires. Our Limited, though, came with 17-inch Eco-Spoke alloy wheels and P225/45R17 tires. Other Limited extras included automatic HID headlights, power tilt-and-slide sunroof, LED daytime running lights and taillights, body-color heated outside mirrors with turn signals, and body-color door handles with approach lights built in. Leather seats are included on the Limited, along with a color touch-screen audio system with backup camera, Android Auto and Apple CarPlay, HD/AM/FM/satellite radio, and Bluetooth hands-free phone system; a 4.2-inch color driver-information screen above the steering column; dual automatic climate control; heated front seats; leather-wrapped flat-bottom steering wheel and shifter knob; power windows/door locks with proximity key entry and pushbutton start; and power-adjustable driver’s seat and lumbar support. Safety gear included electronic stability control with traction control; four-wheel antilock disc brakes with power-regenerative braking, electronic brake-force distribution, and brake assist; front side-impact air bags, side-curtain air bags for both rows, and driver-knee air bag; blind-spot detection with rear cross-traffic alert and lane-change assist; and individual tire-pressure monitoring. Our Limited tester came with the Ultimate Package ($3,000), which added automatic emergency braking, radar cruise control, lane-keep assist, adaptive headlights, rear parking sensors, a navigation system with eight-inch touch-screen display, Infinity premium audio with eight speakers and Clari-Fi music restoration, wireless charging for smartphones, cargo cover, and floor console-mounted rear air vents. The only other extra was the carpeted floor mats ($125). The exterior of our vehicle was the pleasant Ceramic White color, and we had the beige interior — seats, dash and doors. Total sticker price for our Ioniq Hybrid Limited was $31,560, including freight and options. Since Fallout 76‘s multiplayer-focused reveal, anxieties have been raised regarding Bethesda’s future support of the single-player platform. In an interview with GameStar, director and executive producer Todd Howard attempted to quell worries with news that future mainline Bethesda projects will be single player. 76, contrary to single-player’s hysteria, can be enjoyed as a solo experience, but early indications suggest the title can only be fully enjoyed in mutiplayer. Thankfully, Bethesda’s future titles—including The Elder Scrolls VI and Starfield—will return to the developer’s roots. Howard also commented on 76‘s engine, putting to bed the popular notion that the studio is running off a decade old engine. He stated that the engine has been continually updated for years, with 76 sporting a new renderer, lighting, and landscape generation tools. TES VI and Starfield will see further refinements. For more on Fallout and the world of single-player, be sure to follow OnlySP on Facebook, Twitter, and YouTube. Some changes are obvious. The Switch port uses very aggressive on-the-fly resolution changes, dropping the game to as low as 640 x 360 even when you dock your system — this is a game best-played in handheld mode. Panic Button also dropped the target frame rate to 30FPS, reduced texture quality and produced noticeably simpler water effects without reflections and 3D interaction. Other changes, however, are subtler. While the gameplay is intact, there are minor changes to the environment to keep the performance up (such as inserting a wall to block an extremely detailed backdrop). Volumetric lighting and shadowing aren’t quiet as detailed, either. And in some cases, there are performance improvements. The frame rate is usually more consistent than it is on regular PS4 and Xbox consoles (not to mention the earlier Doom release on Switch), while cutscenes start sooner. All told, Wolfenstein II‘s Switch version isn’t going to be as superficially impressive as it is elsewhere. Panic Button made a slew of compromises, and you’re going to notice them. Nonetheless, it’s a testament to the Switch’s relative power that Panic Button didn’t have to resort to more drastic measures, like chopping the levels into smaller pieces or noticeably simplifying the geometry. You can play the game largely as Bethesda, MachineGames and id originally intended — something unthinkable on a portable system just a few years ago. / For years, people weren’t sure if gravitational wave were a necessary product of relativity. 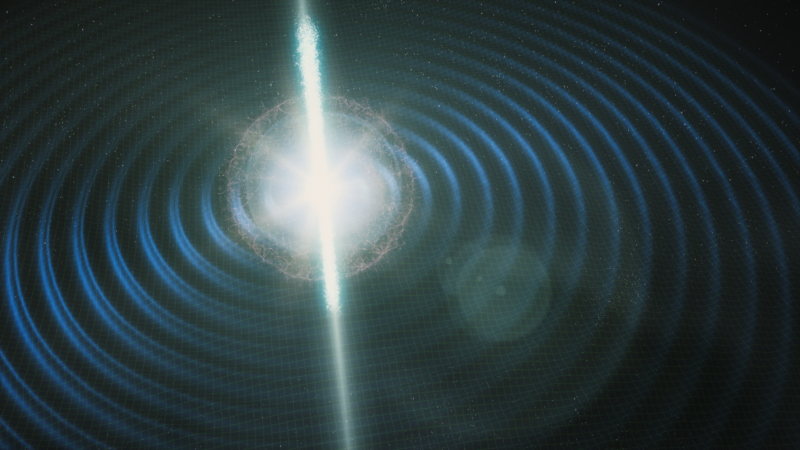 LIGO’s detection of gravitational waves came almost exactly a century after Einstein had formulated his general theory of relativity and an ensuing paper mathematically describing the possibility of gravitational waves. Or at least that’s the story as it was presented to the public (including by yours truly). And in some ways, it’s even true. But the reality of how relativity progressed to the point where people accepted that gravitational waves are likely to exist and could possibly be detected is considerably more complicated than the simple narrative described above. In this week’s Nature Astronomy, a group of science historians lays out the full details of how we got from the dawn of relativity to the building of LIGO. And, in the process, the historians show that ideas about scientific revolutions bringing about a sudden, radical shift may sometimes miss the point. Hexbyte – Tech News – Ars Technica | Has your paradigm shifted? The popular conception of scientific revolutions (to the extent that it exists) was shaped by Thomas Kuhn. Kuhn described a process where data gradually pushes an existing theory into crisis, allowing nearly everyone to see it doesn’t work. After a period of crisis, a revolution takes place and a new theory emerges. The theory’s ability to solve all the problems that precipitated the crisis quickly draws support, and a new period of theory-driven—in Kuhn’s language, “paradigm-driven”—science begins. On some level, this lines up nicely with the story of relativity. Einstein’s proposals did create a new paradigm of curved space-time, and they resolved a number of problems with Newtonian gravity and rapidly picked up experimental support and acceptance. And less than a year went by before Einstein published a paper that used the new paradigm to produce gravitational waves. The paper was wrong, but he published a more correct version a few years later. The revolution that set the stage for discovery a century later was complete. But the historians (Alexander Blum, Roberto Lalli, and Jürgen Renn) would like to rain on that particular paradigm-shifting parade. And they do so by focusing on the aftermath of Einstein’s formulation of general relativity. For starters, gravitational waves didn’t emerge neatly from Einstein’s work on them. Einstein didn’t seem to have given serious consideration to their existence until prompted to by Karl Schwarzschild (of radius fame). His first paper on them contained a math error, and his corrected version only worked if the waves propagated along a cylinder. While this paper serves as the basis for claims that Einstein predicted the existence of gravitational waves, it was clearly an approximate solution in a simplified environment. This is the Porsche 919 Evo, the ultimate version of its three-time Le Mans-winning hybrid race car. Timo Bernhard is one of Porsche’s racing drivers and the man who just shattered a 35-year lap record at one of the scariest race tracks in the world. In May of this year, Porsche treated the fans at the 24 Hours Nürburgring race to some exhibition laps by the 956 (which set the record in 1983) and the 919 Evo. For many sports car fans, the days of Group C in the 1980s was the high water mark for the sport. The team fettling the car before Bernhard’s run. With more than 1,100hp and active aerodynamics, the 919 Evo can carry almost unbelievable speed through the corners and down the straights. There must be something in the air. On Friday, we brought you news about Romain Dumas and Volkswagen breaking records at the Pikes Peak International Hill Climb. Just five days after Dumas’ made it to the top of the mountain, his colleagues at Porsche Motorsport—the team with which he won Le Mans in 2016—have gone and shattered another record some thought would never be broken. The track is the 12.9-mile (20.8km) Nürburgring Nordschleife, and Porsche factory driver Timo Bernhard drove a Porsche 919 Evo around it in just 5:19.55. When the shorter and much safer Nürburgring GP-strecke opened in 1984, the Nordschleife’s days of hosting the very fastest racing series was over. Bellof’s time, therefore, was presumably the last word in speed around this dangerous ribbon of tarmac. Until the 919 Evo program, that is. After Porsche won Le Mans for the third time with the 919 Hybrid—bumping to 18 its total overall wins at the French race—the car maker decided to end the 919 Hybrid racing program. But instead of just sticking the race cars in the museum, Porsche decided to see how fast they could really go. New engine management software and no need to abide by a fuel-flow restriction bumped the 919’s turbocharged V4 engine output from 500hp (373kW) to 720hp (537kW). The hybrid system is 10-percent stronger at 440hp (328kW). The “official” Raspberry Pi case won’t win awards for aesthetics, but it’s simple to assemble and disassemble. Last April, Nintendo bizarrely halted sales of the hot-selling retro console, sparking us to resurface this guide. And with the news that Nintendo relaunched the console this week—but yet again supply is an early hurdle for interested gamers—we’re re-running this piece to help those of you with a DIY streak once build your own, more flexible alternative. Hardware recommendations have been updated and lightly edited to reflect current availability and pricing for June 2018. Make something powerful enough to easily emulate 8- and 16-bit consoles—anything above and beyond that would be great, too, but for these prices you won’t be emulating many games released after the end of the ’90s. It’s worth noting, however, that Raspberry Pi has released an updated Model B+ version of the computer since we published the initial version of this guide. That model brings a faster CPU and improved networking, so it may be the wiser choice in 2018. It’s available for $49 on Amazon with a power supply and heatsinks, or $43 for just the motherboard. The Pi has no built-in storage, so you’ll need a microSD card. You’ve got a lot of choices here, but both the 32GB and 64GB SanDisk Ultra cards—available for $12 and $22, respectively—are solid, affordable options. These are both overkill capacity-wise, but I want to leave plenty of room for future library growth. Whatever card you buy, you don’t want to cheap out: even the best microSD cards don’t have stellar performance, and that’s definitely true when you’re using them as the primary storage drive on a computer rather than as a place to dump large photo or video files. The Wirecutter recommends Samsung’s EVO Select cards, for instance, saying they can hang with or handily beat pricier offerings from other companies. Those cost $12 for a 32GB card and $20 for a 64GB card, if you want to try something faster. If you like the feel of an old-school gamepad mixed with the convenience of wireless controllers, 8bitdo makes a fantastic Bluetooth SNES pad available for about $31; it’s worth it, given that you can use them as wired controllers with micro USB cables and since the wired models are generally more expensive. You can get them with both SNES-style purple buttons and Super Famicom-style multicolor buttons, depending on which you prefer. / A reporter buys a Capital Gazette newspaper on June 29, 2018, in Annapolis, Maryland. 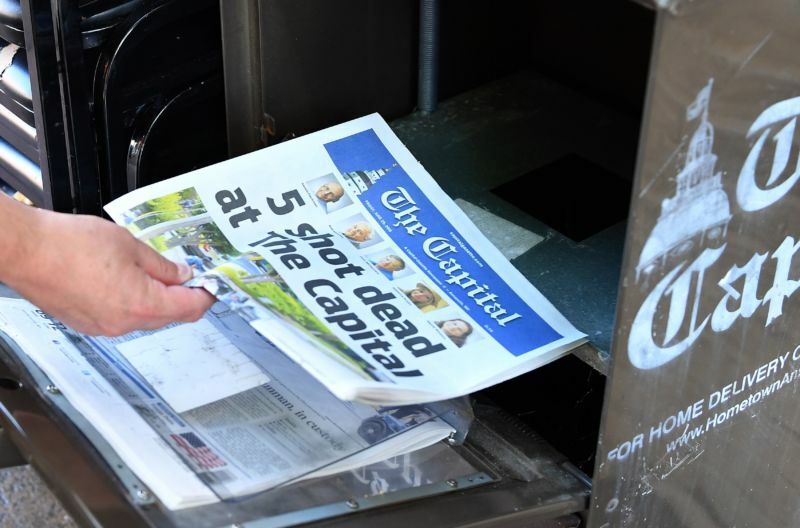 Maryland authorities used their facial recognition capabilities to identity Jarrod Ramos, the suspect in the Capital Gazette shooting, which left four journalists and one newspaper sales associate dead on Thursday. When he was apprehended at the scene of the horrific crime in Annapolis, Ramos had no identification and seemingly would not speak to police. Investigators then appeared to have taken a mugshot or some other similar type of photo and fed it into the state’s Maryland Image Repository System (MIRS). That database contains approximately 10 million driver’s license images and mug shots, according to documents released by Georgetown University researchers. The result, according to the Baltimore Sun, was a hit for Jarrod Ramos, a 33-year-old man from Laurel, Maryland who apparently had a years-long grudge against the local newspaper. / A booth in support of Shiva Ayyadurai, who is running against Sen. Elizabeth Warren (D-MA), displays an ‘Photoshopped’ image of Warren wearing a Native American headdress inside the Conservative Political Action Conference Hub at the Gaylord National Resort and Convention Center February 23, 2018 in National Harbor, Maryland.